FEATURING:Hitachi Seiki Hitec-Turn HT-20 CNC Turning Center s/n 21884 w/Fanuc GN10 Controls, Tool Presetter, 10-Station Turret, Tailstock, 8” 3-Jaw Chuck, 5C Collet Closer, Coolant. Hitachi Seiki Hitec-Turn HT-20 CNC Turning Center s/n 21579SC w/ Fanuc GN10 Controls, Tool Presetter, 10-Station Turret, Tailstock, 8” 3-Jaw Chuck, Coolant. Brown &Sharp Ultramatic R/S No.3 1 ¾” Cap Automatic Screw Machine s/n 542-3-430 w/ (4) Cross Slides, 6-Station Turret, Bar Feed, Coolant. 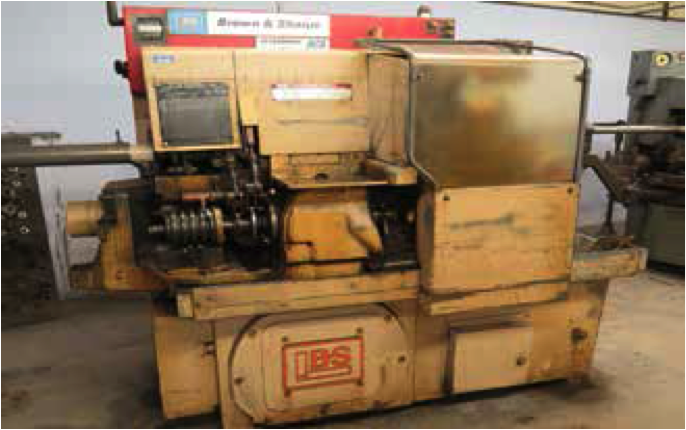 Brown & Sharp No.3 1 ¾” Automatic Screw Machine s/n 542-3-297 w/ (3) Cross Slides, 6-Station Turret, Bar Feed, Coolant. Brown & Sharp No.2 1 5/8” Cap Automatic Screw Machine s/n542-2-6742-1 5/8 w/ (3) Cross Slides, 6-Station Turret, Bar Feed, Coolant. Brown & Sharp No.2G 1 ½” Cap Automatic Screw Machine s/n 542-2-532 w/ (3) Cross Slides, 6-Station Turret, Bar Feed, Coolant. Brown & Sharp No.2G 1” Cap Automatic Screw Machine s/n 11057 w/ (3) Cross Slides, 6-Station Turret, Bar Feed, Coolant. (2) Brown & Sharp No.0G ¾” Cap Automatic Screw Machines s/n’s 542-0-1568, 542-0-1304 w/ (3) Cross Slides, 6-Station Turret, Bar Feed, Coolant. Hardinge mdl. HC Hand Chucker s/n HC-23340 w/ 125-3000 RPM, 8-Station Turret, Power Feeds, 5C Collet Closer, Coolant. Hardinge / Bradmatic mdl. DSM-59 Retrofitted Automatic Lathe s/n DV-59-11535 w/ Bradmatic Pneumatic Controls, 230-3500 RPM, 5C Collet Closer. Bridgeport Series 1 – 2Hp Vertical Mill s/n 204284 w/ 60-4200 RPM, Chrome Ways, Power Feed 9” x 42” Table. Bridgeport Vertical Mill s/n 138253 w/ 1.5Hp Motor, 60-4200 RPM, Power Feed, 9” x 42” Table. Burke / Powermatic mdl. 2D Automatic Horizontal Mill s/n 7410-1 w/ Pneumatic Feeds, 8” x 36” Table. Boyar Schultz Six-Twelve Deluxe 6” x 12” Surface Grinder s/n 18670 w/ Magna-Lock Electromagnetic Chuck. Barrette Centrifugals Chip Spinner s/n 3010109E. HDT mdl. HDG-20 20” Pedestal Disc Sander s/n 6624. Duracraft 5-Speed Bench Model Drill Press. BelAire mdl. WT35A803V 5Hp Vertical Air Compressor s/n 9992.